And as Gene Roddenberry realized with the creation of Star Trek in 1964, it is the future of Mankind’s very survival. It’s time to stop thinking small as in planet Earth, and start thinking big as there is a whole universe out there! Russia and China get it–hence their development and testing of anti-satellite rockets and other “kill vehicles” in space as well as lasers and jamming equipment against our satellites, and of course, their plans to colonize the Moon and land men on Mars and beyond. 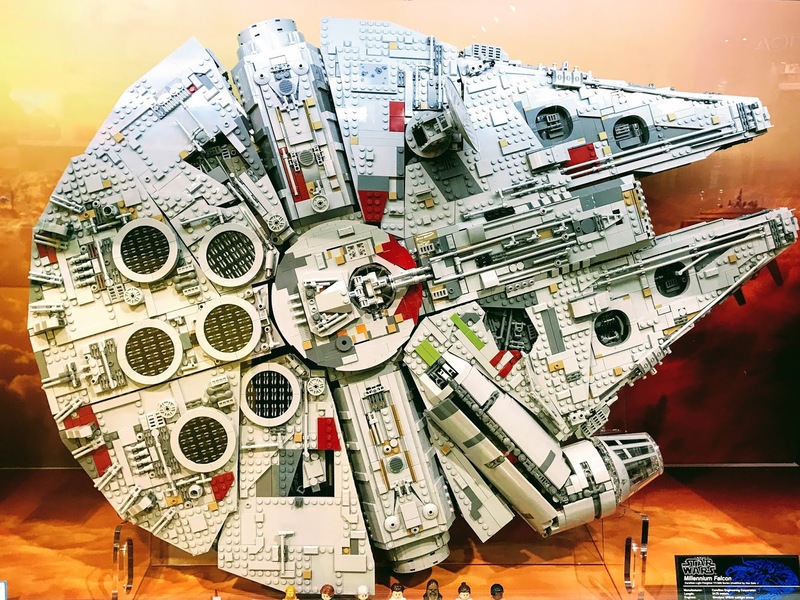 Yes, there have been a few notable exceptions such as President Reagan with his vision for the Star Wars’ Strategic Defense Initiative and President Trump with the bonafide stand up of a Space Force. Some of the Pentagon brass, particularly the Air Force, may hem and haw about the politics of this thing…losing money and prestige for their branch of the military, but their power is not the concern, our power as a nation is! I envision a day in the not too distant future when the Air Force doesn’t run Space Command, but rather Space Force runs the Air Force. Here are Andy Blumenthal’s technology forecast and priorities for 2018. 1. Medical Computing – Continue the significant progress and solve the great illnesses of Cancer, Parkinson’s, ALS, Alzheimers, and so many other horrible and debilitating diseases. Along with longevity, we need to alleviate human suffering and create a higher quality of living for all people. 2. Environmental Computing – Develop more and better clean technologies that can eliminate the Great Plastic Garbage Patch and other heart-breaking garbage dumps and environmental disasters around the world–clean up, breakdown, recycle, and create a more sustainable and beautiful planet for everyone to enjoy. 3. Quantum Computing – Achieve the ultimate processing power and speed of quantum computing to enable us to solve the greatest of mankind’s problems including WMD, and cyber security threats as well as the overcome the transportation and colonization challenges to reach, explore, and settle the depths of outer space. So on July 4th, I wrote and did a short video about how messed (f*cked) up things are in the world today (of course, technology-aside), and I advocated for people being a good influence and for constructive change. On the positive side, I saw this neat bumper sticker to “Unf*ck The World,” and I checked out their website utwnow.org. It was impressive to see people advocating for, banding together, and engaging to do good things to help others such as assist the homelessness by giving them haircuts, doing laundry, providing “mobile hygiene,” and helping with a thrift shop and job opportunities. In contrast again, it was interesting in the Wall Street Journal today, there was an editorial on how Brexit (Britian leaving the EU) has nothing on Amexit (America’s disengagement from global affairs). Around the world, there is cause for not only pause, but great concern. – From allowing Syria to cross the red line in using chemical weapons (on civilians!) to the recommendation to not charge the former First Lady, we are in moral and leadership retreat. – Russia takes over Crimea and agitates in Eastern Ukraine and the Baltics, while China continues its island buildup in the strategic South China Sea. – ISIS continues to hold ground across the Middle East and Northern Africa and attacks targets literally everywhere in the world and routinely takes, enslaves, and sells women to the highest bidder on the Internet. – North Korea and Iran test ballistic missiles, and nukes are a forgone conclusion for them. – South America and Europe are in economic and political turmoil with varying degrees of recessions, runaway inflation, shortages, impeachment proceedings, voter recalls, and fractioning. – The U.S. is struggling to maintain its leadership role as we fluctuate between recognizing the dire need and pulling back all around. What we can do locally to help–and certainly there is a lot more to do there with poverty and homelessness–perhaps people can do nationally and globally in demanding more–not material things, but rather a real caring about others and not just ourselves, a genuine discourse on policy and not just punch lines for the next election or media soundbite, a solutions-oriented mindset rather than a gaming the system one, and a big vision to settle the stars, cure vicious diseases, pull everyone out of poverty, and resolve endless cycles of global conflicts. This is a cool video by the Defense Advanced Research Projects Agency (DARPA) on project Phoenix–which is a robot that can repair satellites in space and re-use components from retired satellites around it. Phoenix can intercept, scavenge, and rebuild satellites in space–while orbiting above the Earth at 22,000 miles! In the corner of the video, you can see progress being made in the lab, and in the main video frame you can see an animated version of how this would actually be put to use. Machines working on, building, and repairing machines! Like the fulfillment of a Terminator-like society, where machines can function with autonomy, eventually learning, self-healing, and even propagating. I would imagine that these machines can help not only repurpose and recycle material in space to good use and fix things, but also they can clean up the space junk in orbit–similar to street sweeper trucks in Manhattan! Eventually, these robots will travel to distance worlds–first Mars–to build human colonies and maintain them in inhospitable environments. Almost two decades ago, when working towards my MBA degree, I read the book, Beyond the Limits(1992) about how between growing world overpopulation and our disposition to living without regards to our limited resources, we were in danger of depletion and ultimately face an existential disaster. Now this theme continues with the movie, Surviving Progress(2012) warning that our unabated consumerism and overproduction is leaving in its wake diminished environmental resources and leading eventually to a collapse of our global ecosystem. In between the book and the movie, I have followed the warnings of well known and respected leaders, such as former Vice President, Al Gore on global warning, former Comptroller General, David Walker on our spiraling national debt, oil magnate, T. Boone Pickens on peak oil, and that is just to name a few. Yet, the warnings of our unsustainable living keep running up against our impressive technological progress–for example, oil and natural gas is being discovered and still plentiful, agricultural productivity keeps rising, and computers and automation allows us to continuously do more with less. So what are we to believe–are we on a unsustainable collision course with mother nature that threatens our very existence or is our innovative prowess and technological progress going to keep us ahead of the curve and out of any danger? As a technologist, and someone who promotes innovation, entrepreneurship, hard work and sound supporting ethics underlying everything we do, I am a firm believer that we can make a difference. Yes, with G-d’s blessings, it is possible to shape our destiny, so that we can continue to not only sustain ourselves, but also actually improve our standard of living. On the other hand, I cannot help but notice a generally gluttonous lifestyle in our society–where people almost always seem to buying bigger and better homes, cars, and even now yachts and private planes, and where buying and throwing things out is a vicious and endless cycle, where we live for the moment, rather than plan ahead. Despite initiatives to reduce, reuse, and recycle, we are still very much a single use society (use and discard), where compulsive shopping and a “mine is bigger and nicer than yours” mind-set and motive prevails. Now as humankind plans for Earth’s ultimate resource depletion, companies such as Planetary Resources are researching and developing robotic spacecraft to mine asteroids to get water, extract raw materials, and find new sources of precious minerals, and government agencies like NASAare exploring orbiting space settlements as well as the permanent colonization of the moon and Mars. At the end of the day, the Earth–no matter how large and bountiful–is a finite resource and we should use innovation and technology to extend its use and at the same time reach out to find our next hospitable home. Watching two seasons of a Discovery television series called The Colonyabout how people in a simulation of a global catastrophe, survive–I saw that no matter how well they did for a number of weeks living off of existing resources where they were, eventually, they had to plan and creatively build their escape to a new sustainable living place. Unfortunately, this is not just TV fiction, but this is our reality–to thrive in our world today, but also to plan and build for the long-term–a new home for mankind. What can be more thrilling than the promise of space exploration and the virtually limitless possibilities that it holds. Since the Apollo 11 mission in 1969, the first manned mission to land on the moon, we have dreamed of the next step in terms of an actual colony of humans living there. In 1975, the science fiction TV show Space: 1999, that many of you may still remember, envisioned what this space colony could look like (until a nuclear mishap sends the colony hurling through space). From 1984, you can see attached, a NASA’s artist rendering of a colonized moon along with astronauts and lunar rover. Now in 2012, with the presidential campaigning in full swing, we are hearing the promise of such a manned lunar colony once again and it is still just as exciting as ever. 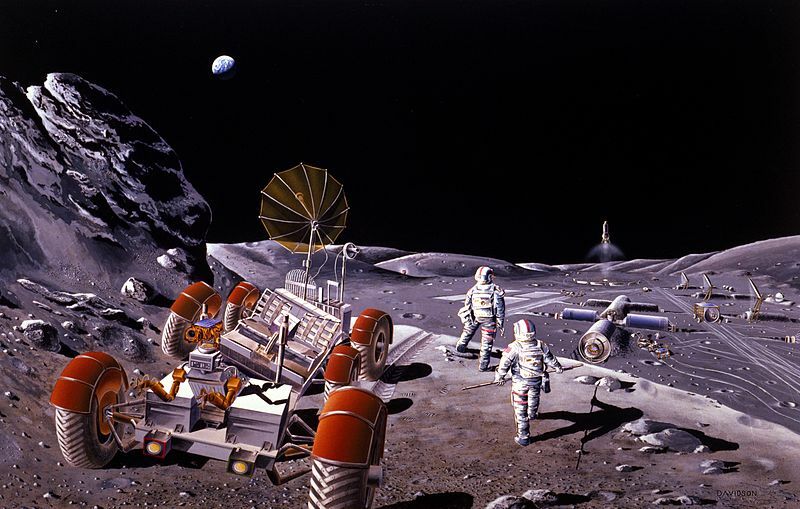 One candidate, called for the lunar colony to be bustling with commercial activity by 2020–wouldn’t that be amazing! While it was funny when this candidate said that once the colony reached 13,000 American inhabitants, they can petition to become a state, it also somehow brought it into a new perspective and made it so real–like could this really happen one day? The idea of expanding beyond our limits here on Earth, making new discoveries, tapping into potential new resources, and harnessing ever greater innovation from such exploration can bring hope of a better, brighter tomorrow to all.